Twice baked potatoes were always considered a special side dish in my family when I was growing up. They would be made and served only if someone requested them for their special birthday dinner. Or if we were lucky, we just might get to bite into one on New Year’s Eve. The twice baked potatoes are out of the oven and ready to be garnished with more bacon and green onions. As much as everyone loved twice baked potatoes, I was always confused on why we didn’t have them more often. We had potatoes as a side dish 3-4 times per week. Most often it would be mashed potatoes, but we were served other potato recipes as well. Cheesy hash-brown casserole, baked potatoes, fried potatoes and even homemade tater tots. But every evening I was hoping to be surprised at the dinner table with homemade twice baked potatoes. It is always best to bake your potatoes in the oven for this recipe. As an adult I have a whole different perspective on the situation. When you are trying to feed 4 hungry kids, and are on a tight time schedule with getting everyone where they need to be, any recipe that requires being baked twice is out of the question! I have a different appreciation of how much time it takes to make a quality meal for an entire family. 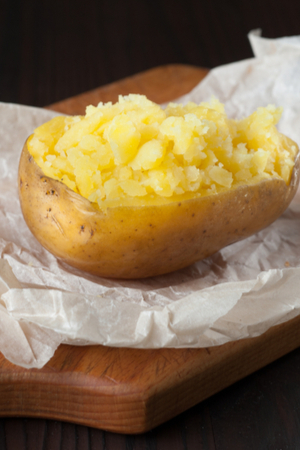 Quick doesn’t always mean better…..
After you have baked your potatoes, let them cool a bit and scoop out the center. Of course, there are a few ways to get Twice Baked Potatoes on the table quicker than the recipe below. Just remember, that quicker doesn’t always mean better. However, I am a realist and realize, there are some times you have to take short cuts. Just know that by following the recipe as written below is the absolute BEST way to make Twice Baked Potatoes. With that said, you could cook your potatoes faster in the microwave. The inside of the potato will not be as light and fluffy. But it could work in a pinch. 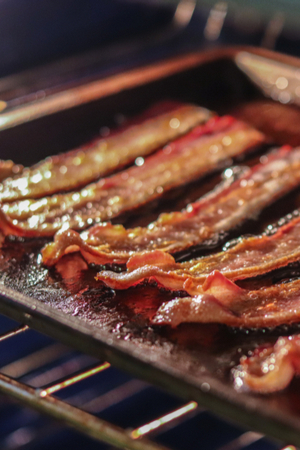 You can actually bake your bacon at the same time your potatoes are baking. They take about 15-20 minutes to become crisp or save time and cook bacon in the air fryer! We wrap our potatoes in wet paper towels when we microwave them. This helps them from drying out during the microwaving process. Depending on the wattage of your microwave, it should take about 8-12 minutes for them to be cooked through. However, I have found a better way to save time without sacrificing the quality of the twice baked potatoes. On a day that I have plenty of time, I will baked a whole tray full of potatoes. I will then make the filling and once the potatoes have fully cooled, I put the mixture back into the potato skins. Loaded twice baked potatoes ready for the plate. Then I can freeze them until I am ready to bake them. 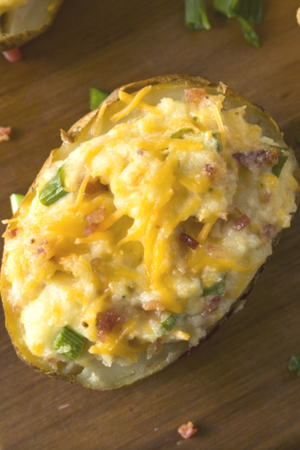 Add a little topping of cheese, bacon, and green onions and you have twice baked potatoes ready to go in the oven. Reheat them in a foil covered pan at 425 degrees F. for 35-40 minutes and you are ready to serve. 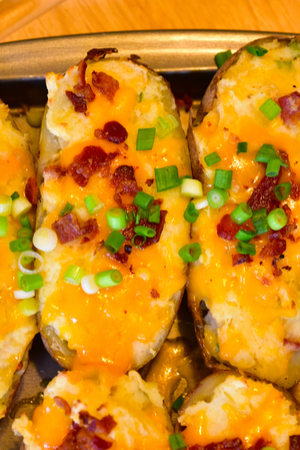 And if you love twice baked potatoes, you are going to love our appetizer potato skins recipe! 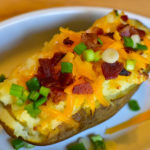 A twist on traditional baked potatoes with a light and creamy mashed potato layered inside a baked potato shell and loaded with cheese, bacon, and green onions. 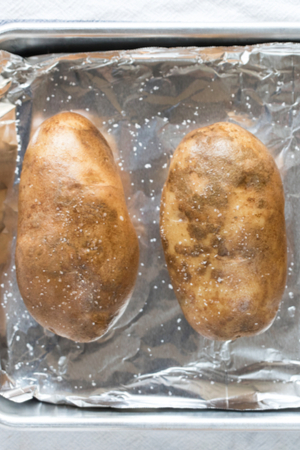 Wash the potatoes and bake directly on the oven rack for 50 minutes or until the potatoes are tender but the skins are not wrinkled. Allow to cool enough to handle. Slice a 1" strip of the skin off the top of each potato to expose the insides. Carefully scoop out the insides and put in a large bowl. Be sure to leave the potato shell intact. Mash the potato pulp and butter together. Add the milk, sour cream/Greek yogurt, cheese, salt and pepper; and 1/3rd of the bacon and green onions. Mix well. Top with the remaining cheese, bacon and green onions.